On one of Brian McKenzie’s, owner of Finger Lakes Distilling, recent trips to NYC, we had the chance to meet up for dinner at one of my favorite restaurants, Joseph Leonard, where, much to my surprise, he revealed the latest in his whisky collection; the McKenzie Pure Pot Still Whiskey. Before anyone could say another word, we had popped the top and was sipping this bright, smooth, happily curious spirit and of course, passing it around to anyone with a willing palate. As soon as you open this bottle, the air around you starts morphing into the most beautiful fruit/oak/mash combo smell. I wish Brian could figure out how to make a candle like this! The stats: 100% malted & unmalted barley grown in the fields surrounding his New York’s Finger Lake region distillery. Distilled in just the copper pot part of his German Holstein pot & column combo still (talk about having the ultimate in distilling flexibility!) bottled without caramel coloring or chill filtration (floaties & chunks are a GOOD thing! ), 40% abv/80 proof in standard 750ml bottles. PALATE: mild front, a slight “water in copper cup” metallic flavor on the tip of tongue, moves into a strong dried apple & apricot middle with rye-like spice on back-end and top back of the throat. It balloons and swells as moves back which is very intriguing. Overall: I would say this is a medium bodied whisky that is very smooth & approachable. A happy choice … if you are lucky enough to find it! Quick addition since publishing this post: Just saw that Drink Up New York has (as of the day of this post) added it to their site for online sales! Click HERE for the link! Thank you, Brian, for leaving the bottle in my excited hands. It’s a pleasure to keep revisiting! This sounds like quite the interesting whisky. Not sure how I feel about the copper cup metallic notes though. Of course, I’d be curious to give it a try. Nice review! Thanks for your comment! I agree (and slightly hesitated) with my publishing of the distinct copper flavor notes I kept getting but I can’t deny my nose & tongue! While I might usually find this off-putting, it did lend itself to a smoother approach in this particular whisky. The “copper/metallic” notes that I kept getting tasted, to me, exactly like the way water tastes when had out of a metal cup (typically done in India or Indian restaurants). Not my favorite for pure water but an interesting twist in this whiskey. 100%!!! Just didn’t want it to sound off-putting as I did enjoy it … but I agree with you all the way; honesty is key. And as this particular whiskey increases distribution, I’ll be curious to read other reviews and see what else is “picked up” from this profile. It may change slightly batch to batch too. It’s always fun to compare! Thanks again, G-LO! Always enjoy conversing w/you. No need to thank me. I do enjoy talking whisky! And I know I’ve said it before, but I am quite pleased to see everyone connecting on the blogosphere. Such a fun filled community! I agree – it’s a really fun whisky blogging community that’s involved and “talking” right now … and I would be crazy not to think think that a large part of that has to do with you & the BoozeDancing crew. You guys are great “connectors” 🙂 and always around for a good conversation, or two! Thanks again!!! LOL! You have a great outlook. May it never change! I’ll definitely check out that blog! Thanks! 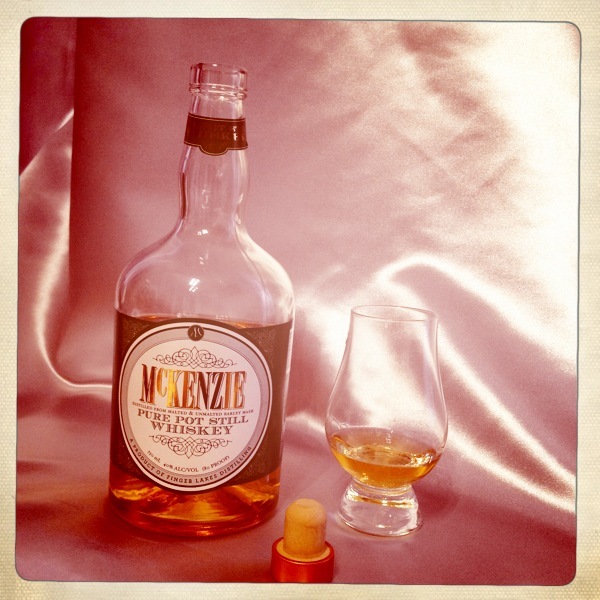 You are currently reading Finger Lakes Distilling: McKenzie Pure Pot Still Whiskey at The Whisky Woman.